Hi there. 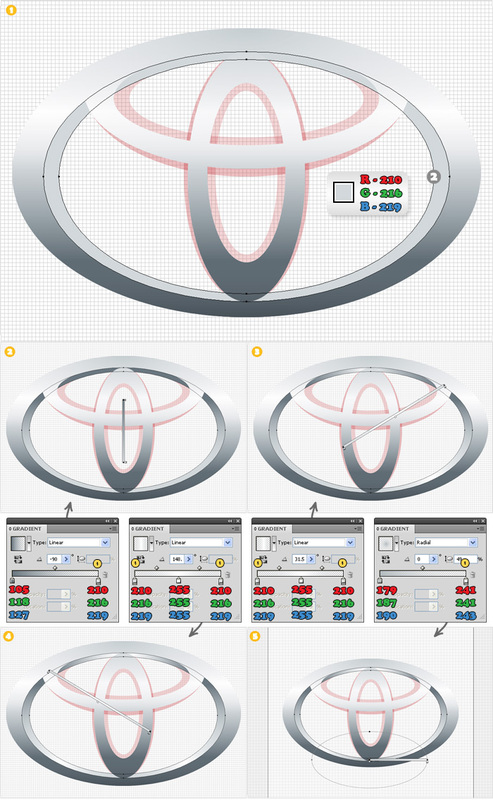 In this tutorial you can learn to create the Toyota logo. It is all about circles and the Pathfinder panel. You will have to create a series of circles of exact dimensions. Regarding that,the grid and the snap to grid option will ease your work. Create a 700 by 700px document. In these first steps you’ll have to create several circles of various sizes. To ease your work turn on the Grids (View > Show Grid) and the Snap to Grid (Vierw > Snap to Grid). You’ll need a grid every 5px. 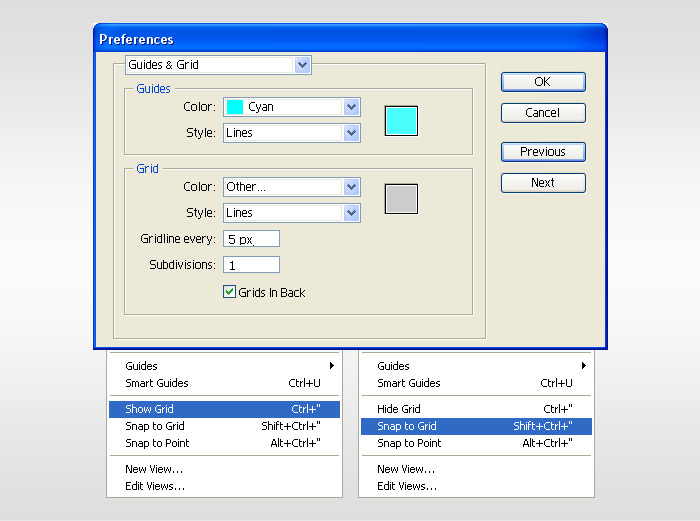 Go to Edit > Preferences > Guides&Grids, enter “5” in the “Gridline every” box and “1” in the “Subdivisions” box. Also, open the Info pallete for a live preview with the size and position of each shape. Finally, to change your document’s measurement units turn on the Rulers (Ctrl + R). Right click on the Rulers and select pixels. 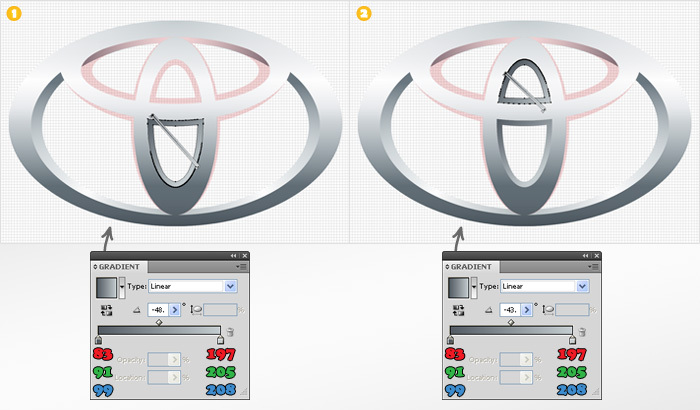 Select the Ellipse Tool(L) and create a 600 by 370px shape. 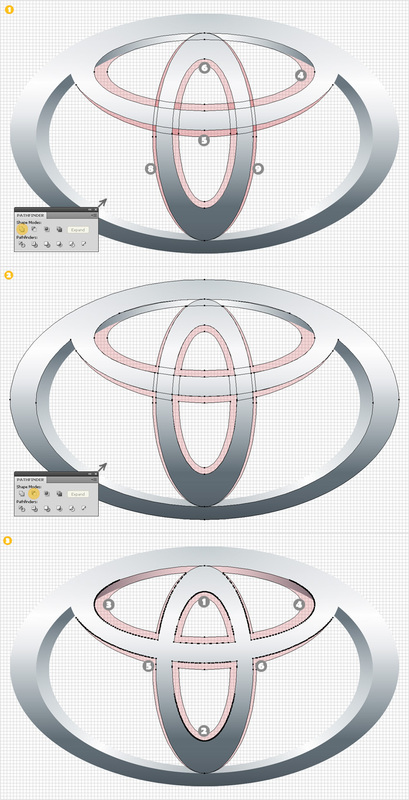 Continue with the Ellipse Tool(L) and create two new shapes. Follow the dimensions shown inside each shape. I filled them with red and lower the opacity so that you can distinguish them easier. You should also try it so that you can see the grids. If you can’t understand the exact positioning for these shapes you can go to step #5 where you can find a zoomed image. 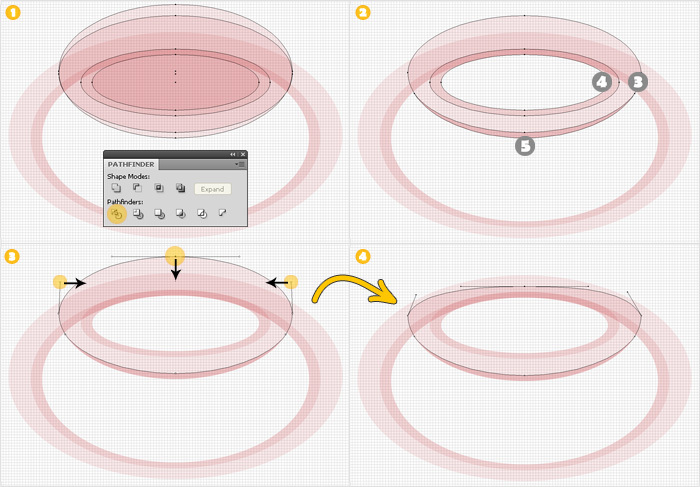 Reselect the Ellipse Tool(L) and create four new circles as shown in the following images. Follow the dimensions shown inside each shape. Duplicate the shape shown in image #3 (Ctrl+C > Ctrl+V). Name this copy “vvv” move it in the bottom of the Layers panel and make it invisible (you’ll neeed it later). 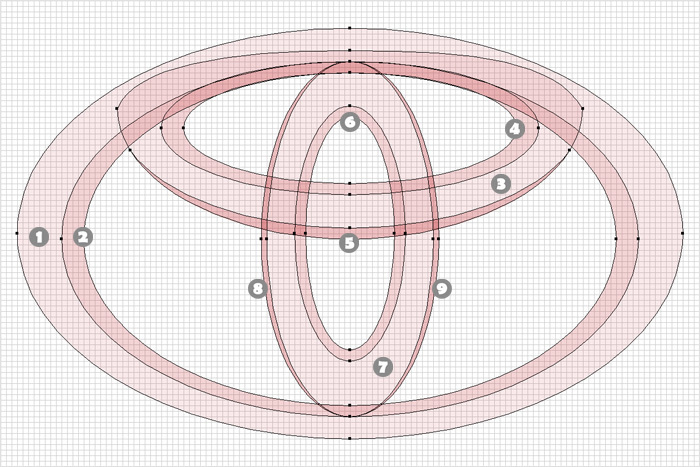 Once again, with the Ellipse Tool, create four new circles. Follow the dimensions shown inside each shape..
Let’s have another look at all the shapes created so far. 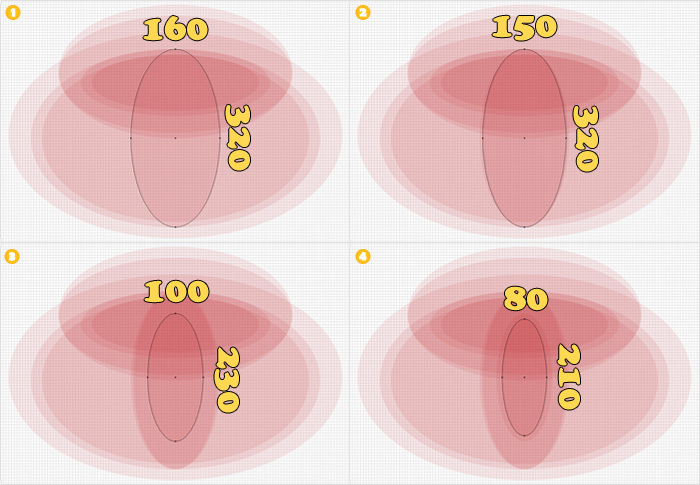 You can take a closer look at the grids to understand the exact positioning for each shape. 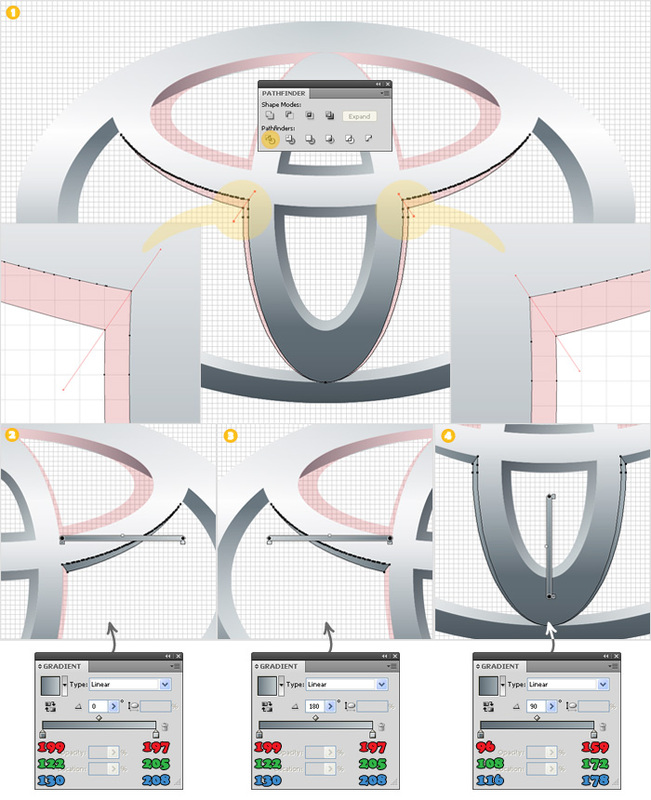 Select the shapes created in step #1 and click on the Divide button from the Pathfinder panel. Keep only the two shapes shown in image #2 (delete the rest) and name them “1” and “2”. 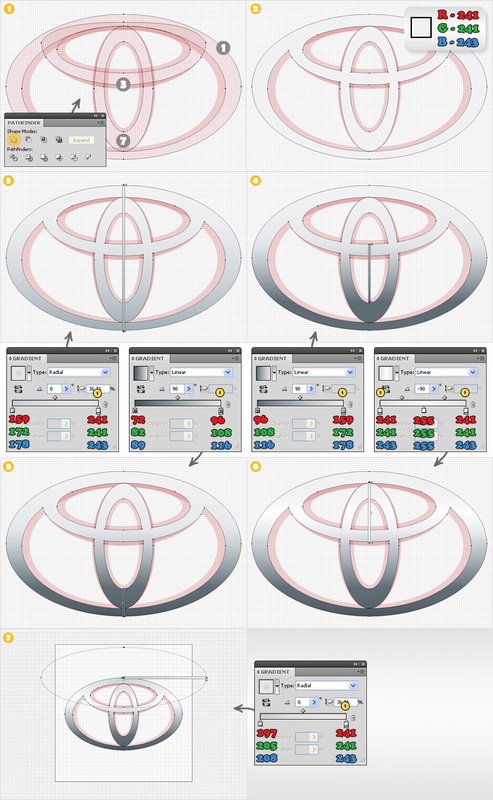 Select the shapes created in step #2 and click on the Divide button from the Pathfinder panel. Keep only the three shapes shown in image #2 (delete the rest) and name them “3”, “4” and “5”. Select shape “3” select the top anchor point (with the Direct Selection Tool) and move it a few pixels down. Also, move the handles inwards. 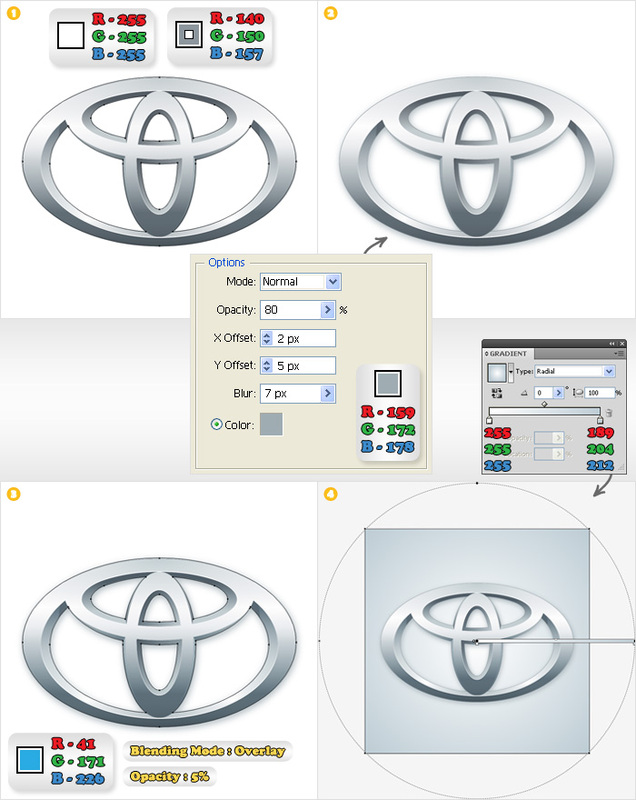 Select the shapes created in step #4 and click on the Divide button from the Pathfinder panel. Keep only the four shapes shown in image #2 (delete the rest) and name them “6”, “7”, “8” and “9”. Once again, let’s have a closer look at the shapes created so far. Select “1”, “3” and “7” and click on the Unite button from the Pathfinder panel. Name the resulting shape “Front”, move it in the top of the Layers pallete and fill it with R=241 G=241 B=243. Now, reselect this shape, go to the Appearance panel, add five new fills (from the flyout menu) and use the gradients shown below. Select shape “2” rename it “Back”, move it below “Front” and fill it with R=210 G=216 B=219. Next, add four new fills (from the flyout menu of the Appearance pallete) and use the gradients shown below. First, create a copy of “Front”. Next, select “4”, “5”, “6”, “8” and “9” and click on the Unite button from the Pathfinder panel. 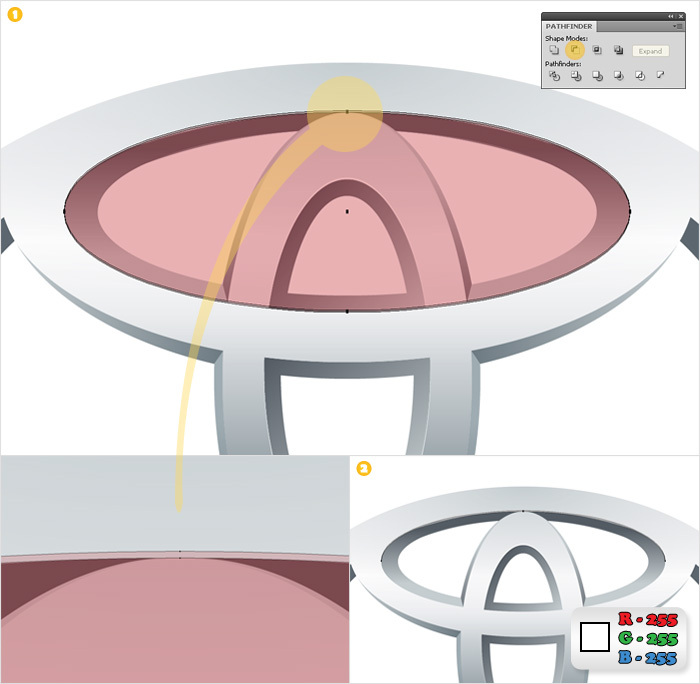 Select the resulting shape along with the copy of “Front” and click on the Minus Front button from the Pathfinder panel. Name these new shapes from “1” to “6” (as shown in image #3). Fill “1” and “2” with the following gradients. Next, you need to slice “5” and “6” in four relatively equal shapes. 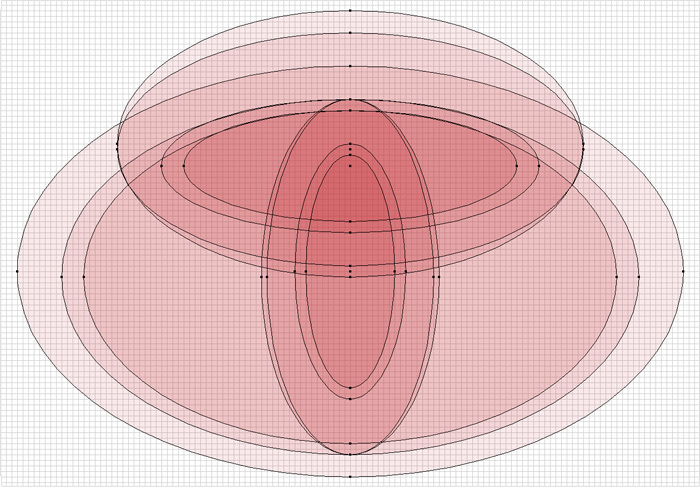 Select the Pen Tool(P) and create two vertical paths (like the red ones shown in image #1). Select these new paths along with “5” and “6” and click on the Divide button from the Pathfinder panel. Select the resulting group and ungroup it (Ctrl + Shift + G). Fill the top shapes with the gradients shown below images #2 and #3. Next, select the other two shapes and group them. Select this group, add a new fill (from the flyout menu of the Appearance pallete) and use the gradient shown below image #4. Reselect the Pen Tool(P) and create three new paths (like the red ones shown in image #1). 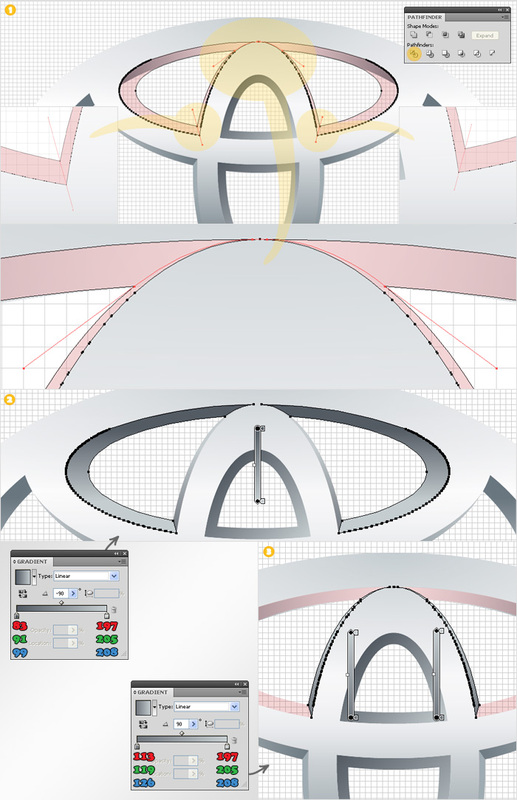 Select these paths along with “3” and “4” and click on the Divide button from the Pathfinder panel. 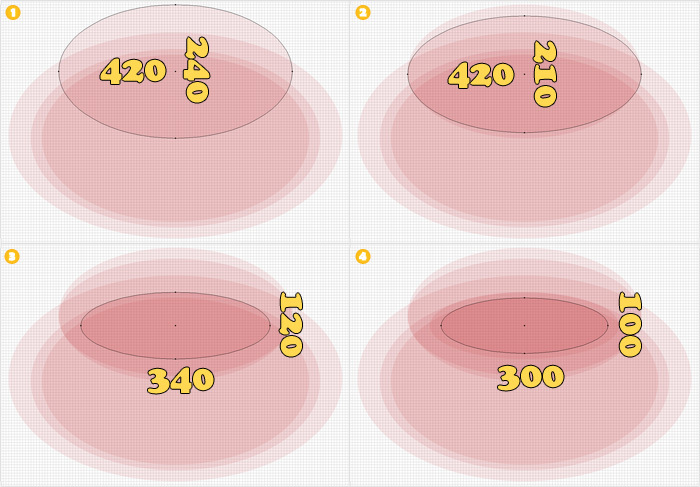 Fill the resulting shapes with the gradients shown in the following images. Select “Back” and hit Shift + Ctrl + [ (to move it in the bottom of the Layers panel). 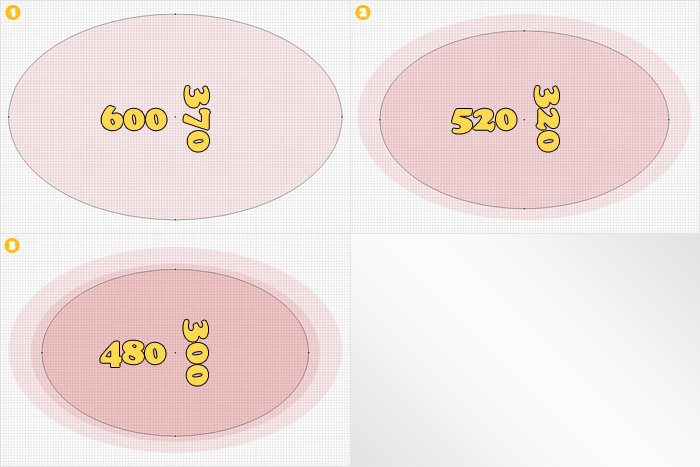 Create a copy of this shape then select the Ellipse Tool(L) and create a circle like the one shown in image #1. Select this new shape along with the copy of “Back” and click on the Intersect button from the Pathfinder panel. Fill the resulting shape with R=83 G=91 B=99 lower its opacity to 60% then move it above “Back”. Create two copies of “Back”. Select the top one and move it a few pixels up. Next, reselect these copies and click on the Minus Front button from the Pathfinder panel. Keep only the shape shown in image #2, fill it with white and move it in the top of the Layers panel. Create two copies of “1”. Select the top one and move it a few pixels up down. Next reselect these copies and click on the Minus Front button from the Pathfinder panel. Keep only the shape shown in image #2, fill it white and move it in the top of the Layers panel. Create two copies of “2”. Select the bottom one and move it a few pixels down. Next reselect these copies and click on the Minus Front button from the Pathfinder panel. Keep only the shape shown in image #4, fill it white then move it in the top of the Layers panel. Turn back on the visibility of “vvv” and duplicate it. Select this copy and move it a few pixels down. 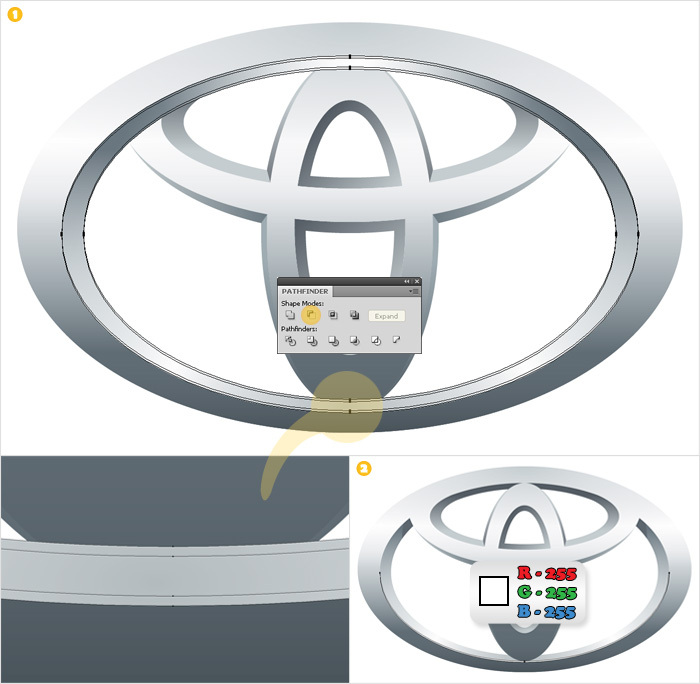 Next, select both shapes and click on the Minus Front button from the Pathfinder panel. Fill the resulting shape with white and move it in the top of the Layers panel. Duplicate all the shapes created so far. Select these copies and click on the Unite button from the Pathfinder panel. Name the resulting shape “Shadow” and move it in the bottom of the Layers panel. Fill it with white and add a 1px aligned to outsite stroke (R=140 G=150 B=157). Select the fill of this shapes and add the Drop Shadow effect shown below image #1. 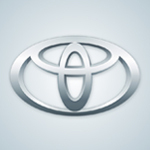 If you want to enlighten this logo, create a copy of “Shadow” and move it in the top of the Layer panel. Fill it with R=41 G=171 B=226, change its blending mode to Overlay and lower its opacity to 5% (do not forget to erase the drop shadow effect of this copy). Finally, for the background, pick the Rectangle Tool(M) create a 700x700px shape and fill it with the gradient shown above image #4. HATS OFF Marius…! please can you post this sort of creating for NIKE LOGO…? i need to check something in that. I really enjoy your tutorial, but I believe some of your measurements are off. a) In step #3 image #3 you gave measurements: 340 by 210. If you compare this height with image #2, you will notice that the height given is wrong. I believe the correct measurements should 340 by 120.
b) In step #3 image #4 you gave measurements: 200 by 300. Again if you compare this height with image #2, you will notice that the height given is wrong. I believe the correct measurements should 300 by 100. Thanks again for a fine tutorial. You were right, I made the correction. Thanks for your attention and support. Awesome Tutorial Marius!!! Great work!!! Great tutorial but I’m stuck on step 10.. every time I create a new gradient fill it covers the last gradient fill. I follow your exact words but I can’t figure out how you have applied all gradients together on that one object. Much appreciation if you or someone else can help me out here. 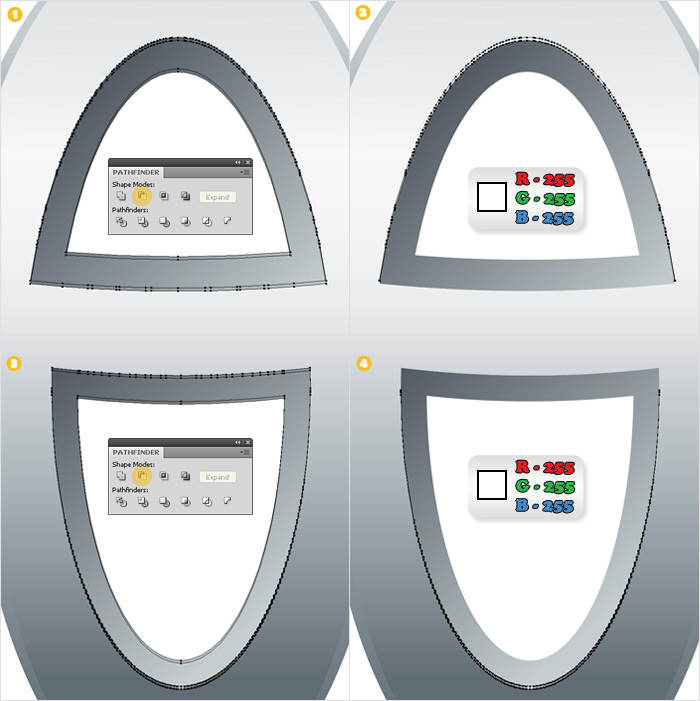 Take a closer look at the images and you’ll see a yellow “0” above the gradient sliders. It means that you need to select these sliders and lower the opacity to 0%. Let me know if it solved your problem. Great tutorial, sir. I’m new to illustrator and this is a great start for me. Thanks a lot. You have error in Step 14. You were right, I messed one number. I made the correction, try it now. Unfortunatelly it’s not possible. But you could use opacity masks to achieve a similar result (although it will require more work time). Marius, this is an outstanding tutorial. Thanks for sharing! Hi. 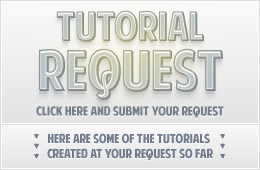 I just want to let you know that I featured your tutorial on my new website. please some1 help me: when u guys says Create a 700 by 700px document…..
where do we create it? using what software?where to download it? The software is called Adobe Illustrator. Wow. This tutorial is inspiring.Being conversant with Photoshop over the years,I sort of lost out on Illustrator but this tutorial and others like it have inspired me to take a break from rasters to vectors. Great job,sire.Great job! Very nice logo. Thanks for sharing. That looks fantastic. At first glance, I thought it was done with the 3d effect. I will have to try this one out. 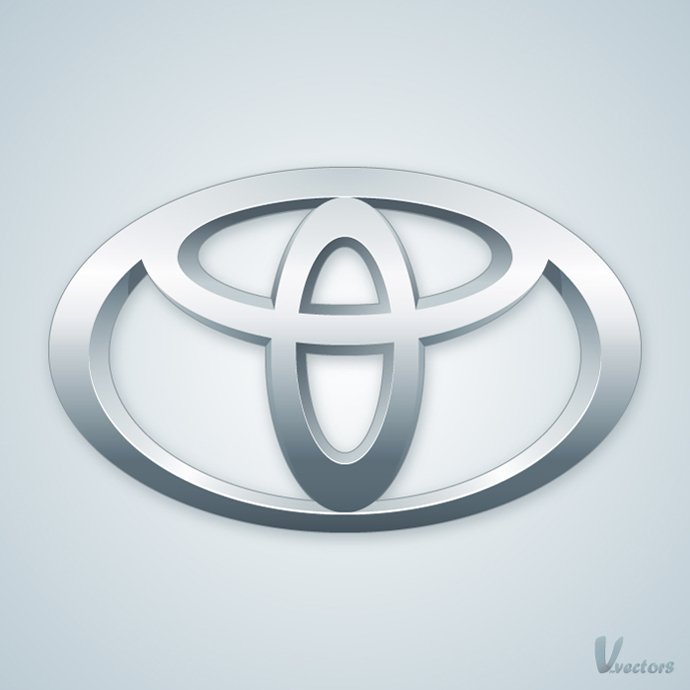 Since one of the author’s favorite pick is the Toyota logo, I thought I would do one. Here is my result. Note: On step 18, it ask for a left gradient color of 199-122-130. However, that is a reddish color and it maybe the wrong color code. You’re good with tutorials. This is also a great website. I think you are a professional designer. It is a awesome tutorials. could you please provide me water splash tutorials. My…………. it’s too much detailed but not too difficult to grab what’s behind the whole idea Thanks a lot.